Unfortunately, the sports card and memorabilia collecting hobby is filled with scam artists and criminals looking to make a quick buck off of collectors like you and I. Many of these lessons I've had to learn the hard way, hopefully the information below will make sure you don't have to. Don't let the information below ruin collecting for you. That would be letting the scam artists win! Collecting belongs to us, not them. Don't cave in and become part of the problem. It may seem tempting to temporarily suspend your collecting ethics from time to time, but remember the slope is slippery. There is no such thing as a victimless crime in collecting. You could be stealing from a kid who mowed his neighbors lawn so he could buy a couple packs of cards. Ever noticed someone spending an unusual amount of time around the card section at Wal-Mart or Target feeling the packs? Those people are called "pack searchers". They are "stealing" without technically "stealing". What they do is feel for hits (Jersey/Autos) and only buy those packs, leaving a heap of crappy cards for the legit buyer. Rest assured, even if you haven't seen this happening at your local retailer, it is happening. I would venture to say there is not a single retail box in country that hasn't been searched after a week on the shelf. When buying retail, I always buy the Blaster Box. Although, if you have a hobby shop near you, this is hands down the safest and best way to buy packs and boxes. On top of that, a "hobby" pack (packs only sold at hobby stores) have infinitely better odds of getting good cards. The only reason I ever buy retail is when I get that "impulsive" itch to open something. I have many theories on who makes these and who is responsible. But, until proven, they are nothing more than "conspiracy theories". What I can tell you is that this is a major problem in the secondary market. eBay is the easiest way for a scam artist to quickly flip a fake. Topps Rookie Premiere Autos are probably the most counterfeited autos on the Market. It's becoming hard for even Topps to identify whether they are fake or not. Counterfeiters have gotten good enough to create fake 2001 Bowman Chrome Albert Pujols Autos. If an eBay seller has too many "finite" cards, there's a chance they are fake. "Buy Back" Autos are a popular scam with novice counterfeiters. 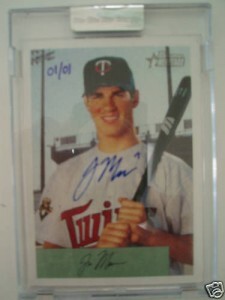 Go on eBay and look up "Joe Mauer Auto" and you'll see a prime example of this. Then look at all the "Un-Circulated Bowman's Best Autos /20". It is simply not conceivable that there are more than 5 un-circulated cards on eBay without there being a single regular version (The Print run of the Un-Circulated is 20, while there is over 500 of the circulated version). What these scam artists do is crack open an "un-circulated case" and throw a High Dollar card in place of a low dollar card. Thus, creating an infinitely more valuable card by doing little to no work. Any seller of cards without a "storefront" could be considered a Gypsy. This means they are accountable to "no one" and cannot be found or called out. They travel from town to town treating there table like it's a store, acting as though they can only give you "40% Book for your cards in trade", when in reality they are just collectors pretending to be stores. Unlike eBay or a Hobby Store, you have zero protection when buying from one of these nomads. There are a lot of good people at card shows, but I would be telling a blatant lie if I were to tell you that every table at a card show has integrity. Get to know your local "card show" scene, there are plenty of good people, with good tables, that have formed alliances with like-minded collectors. The "Re-Print" is when someone attempts to sell a Re-Print by representing it in a manor that suggests it is the real card. I have noticed this happening often with the 2001 Topps Traded Ichiro Rookie. The good thing is that the card companies make it fairly easy to decipher a Re-Print. They understand what is at stake when they make a Re-Print, so they'll often use a different picture, add gloss, or add or subtract things like foil. The "Mis-Representation" is when someone attempts to sell a card within the same brand or even set as the real card you are looking for. A great example of this is found in 2006-07 Upper Deck Hockey; the Evgeni Malkin Checklist upon first glance appears to be his Young Guns Rookie. The only difference in appearance between the $120 Young Guns Rookie and the $10 Checklist is that Malkin is wearing a Black Jersey on his Young Guns Rookie and a White on the Checklist. This is when someone basically "screws" you over on eBay and tries to brush you off or intimidate you to not take action. The primary tool at their disposal is "feedback". An honest seller cares about having good feedback, so when a scam artist threatens to leave "un-true" negative feedback, the honest seller caves in and looks the other way. If you've done nothing wrong and have truly been screwed over, do not back down. eBay does an excellent job of policing this type of activity. These are grading companies that throw out 10's left and right. They also grade fakes and cards that have been "trimmed" or "doctored". The only grading companies I will even consider paying top dollar for are BGS, SCG, and PSA. Remember, the slab your card is in does matter. Even if the card inside would be a BGS 9.5, a PRO-10 Rated card will sell for 1/4 of that. This one is relatively rare these days, as 99% of hobby stores are run by good people with strong ethics. But, there are some stores that will rip a box until they get all the hits, then pool together every "non-hit" pack and sell them. You can tell a good store by the "hits" you hear coming out of it. To a collector, there is nothing more valuable than having a "trusted" hobby shop to frequent. Also, it is important that you understand that you might be paying a bit more for a pack or box, but it is worth every penny. The noblest thing a collector can do is find a hobby shop to support. At the end of the day, the hobby is only as strong as the hobby shop. There are many forgeries and fakes on the Market. Which is a problem, the even bigger problem is that the only people with the "legal" power to do anything about are the card companies. The point of a "copyright" is to protect the value of a product for both the buyer and the seller. Not acting on "copyright" infringement allows these Peddlers of Purgatory to operate without fear of any serious legal action. The card companies could learn a lot from the music industry. What makes the lack of action far worse is that in the music industry, it was millionaire recording artists losing money, in cards, it's the collectors and hobby stores that pay the heftiest price. This is where someone will setup a fake eBay account to bid up their cards. This creates a false perception of interest and boosts the sale price of the card. If someone sells the identical card several times over, there's a chance they used a "schill" account to win one of their own auctions. This means they either didn't get as much money as they wanted for the card or that they won their own card by mistake while bidding the card up. I would like to note that the majority of people you will come across in the hobby play by the rules. The above represents a small percentage of the hobby. The more word spreads, the lower this percentage gets. Remember that the "scam artist" is nothing more than an "opportunist" that will follow money anywhere. As collectors, we have to power to take away that opportunity, which will cause the "scam artist" to move onto a different industry to plague.